The first four months of my pregnancy with Beckett were spent battling a terrible aversion to any sort of smell. The smell of raw chicken (did you even know raw chicken HAD a smell?!) made me lightheaded and queasy. Any type of body odor, perfume, cologne or deodorant was a quick trip to urp-ville. It didn’t matter if it was a pleasant smell like a freshly cut rose or a hot from the oven chocolate chip cookie, I couldn’t handle it. Everything was magnified a gazillion percent and every tickle in my nostril sent my stomach hurling towards my mouth. But, the old adage of “this too shall pass” held true and after four months I could resume a relatively normal, at least as far as scents were concerned, lifestyle. We are blessed cursed tolerate a single bathroom in our house. It’s honestly fine for the two and a half of us, but becomes beyond awkward and stifling when my in-laws arrive for three weeks at Christmas time. I do love our bathroom though. It has beautiful 12-inch steel gray tile on the floor and up the shower walls and one of the walls is a stunning, deep red color. The shower wall is framed with warbly glass blocks that let in tons of natural light on those oh-so dreary Washington days. And, the little things are perfect – the fixtures are brushed nickel (yay! ), the sink is a pedestal (gotta love it!) and my toilet seat is nice and clean (the only way to go!). The set up that we have for our tub/shower combo requires a shower curtain. There is no way around it and unless you are offering to send over a couple thousand dollars for a remodel, the set up isn’t going to change anytime soon. I unabashedly subscribe to the doctrine that it is easier to just buy a new shower curtain liner every few months for a buck-ninety-nine than spend hours scrubbing away mildew and soap scum stains. But, each time I came home from the store and hung my sparkling-actually-see-through-clean curtain up I was hit with a funky smell. That just opened, newly unfolded plasticky smell. You know it? It sticks in your throat, it stifles your breath and it smells downright icky. But, it always went away after a few hours and we were good to go with our squeaky clean curtain. Please bear with me and remember that I am the chick who couldn’t believe that plastic was really a petroleum-based (as in like gasoline, duh!) product until I read something ridiculously obvious in print a number of months ago. I realize that this is probably not an earth-shattering revelation for any of you. And, it really wasn’t news to me; but it was more of an example of me never thinking of plastic in that way. Plastic – it’s a big word. It is a product that is in our every house, our every workplace, our every automobile, e-v-e-r-y-w-h-e-r-e. I could ramble on and spit out sentence fragments full of mindless data and unknown acronyms, but the reader’s digest version is what you’ll find here. The process of turning petroleum into plastic is highly mechanized and involves the breakdown and arrangement of numerous chemical chains and alloys. The end result can vary from tarps to Tupperware and dog bowls to dashboards. When that final plastic product is made, packaged and sent to the store shelves, it’s not as permanent as one would logically assume. Those compounds and chemical chains can breakdown when exposed to temperature changes – think BPA in the microwave (eek!) – and release fumes or toxic substances. And, some of these agents have been linked in multiple (think hundreds of research on the scale of thousands of people) studies to hormone disruption, respiratory ailments and even certain types of cancer. Well, that acrid smell – yup, it’s linked to this breakdown. No one questions where plastic comes from. No one questions the process required to create the host of products we depend on. No one even questions the breakdown of volatile organic compounds (VOCs). But, people do question the inherent danger or lingering affects of this breakdown. I cannot say for sure whether or not the years spent with a polyvinyl chloride (PVC) shower curtain affected my health or that of my family. But, I cannot turn a blind eye to the overwhelming research that supports the claim that plastics work like a puzzle; they can come apart just like they were put together and this disintegration can lead to the possible exposure to unsafe chemicals. So, what do you do if you are Kate Ferry? 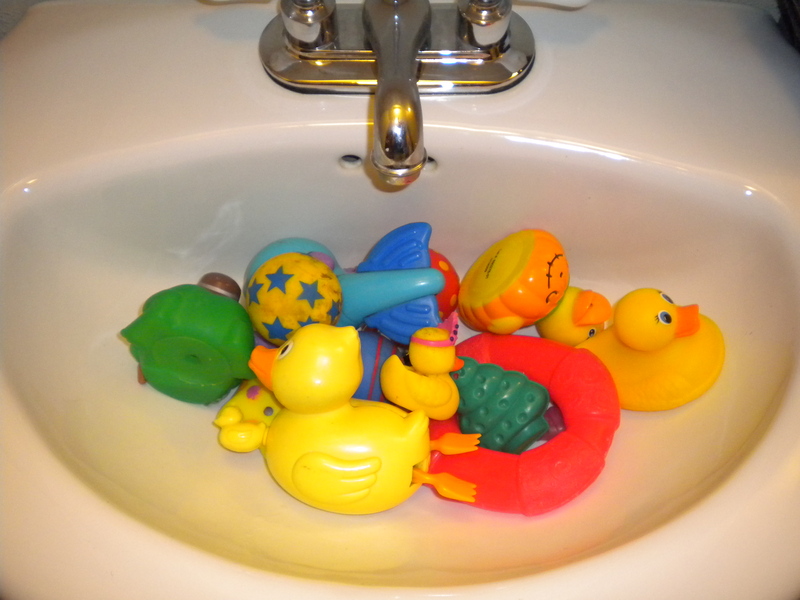 You pull all those toys out of the bathtub and sort through them. See you later cheap, unknown-origin plastic toys that cannot provide adequate labels ensuring the safety of their materials. 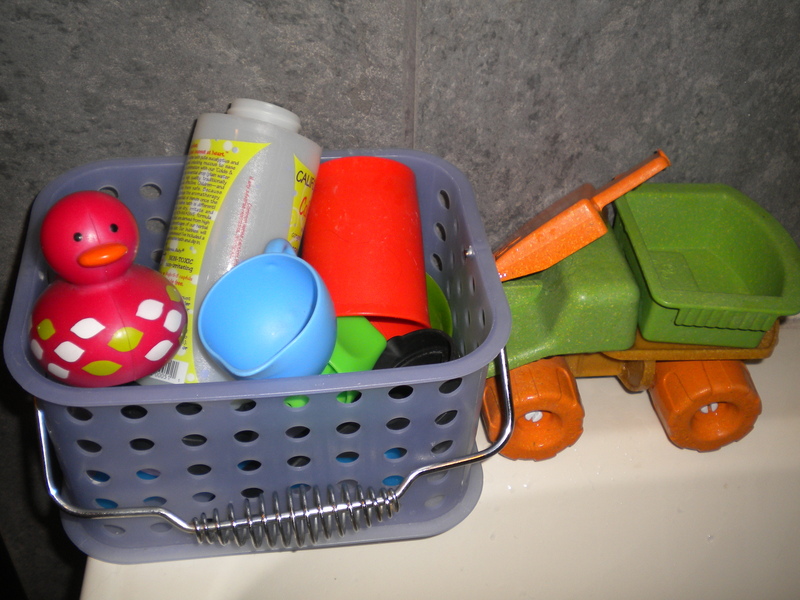 Bye-bye toys with squirt holes – a.k.a. doorways to a breeding ground of mildew infestation. Hello to bath toys made by eco-conscious companies that stand by higher quality and above standard, safe materials. Welcome cups, saucers, scoops and pourers that jumped ship from the kitchen and ended up in the tub. Sayonara buck-ninety-nine shower curtain that smells stinky. Hi there comparable replacement that has the same price point and list of materials I can support – PEVA. OOO! A surprise giveaway! Did you know this was down here?! And, who doesn’t love IKEA?! 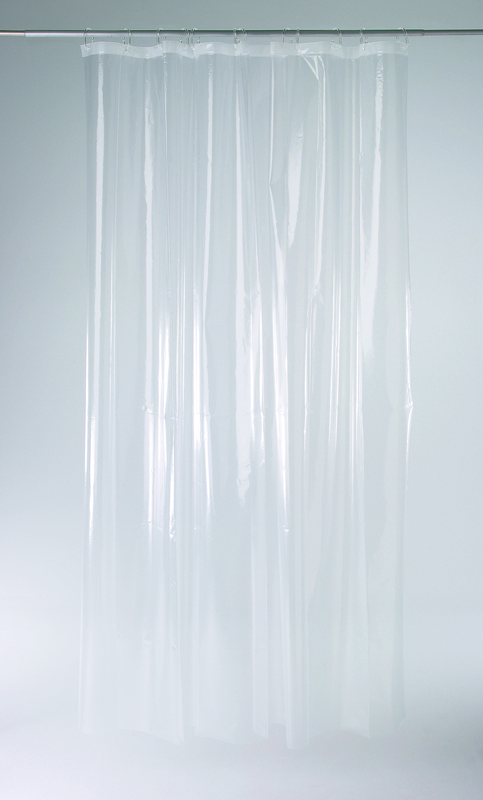 One lucky Sacred Bee Blog reader will win a PVC-Free, PEVA based Näckten Shower Curtain from IKEA! Comment on this post and tell me: What is your favorite thing about your bathroom? Become a fan IKEA on Facebook. Winners will be drawn on Saturday, September 4, 2010 at 8:00pm PST. 9 Responses to What’s that funny smell in the bathroom?! Oh, I need a shower curtain in the worst way! The favorite thing about my bathroom is that soon it will have a heated towel rack. Why there aren’t more of them in the USA is beyond me…they’re pretty standard in Europe, Australia, and NZ. Heated towel rack!? How is it that I’ve never heard of this!? LOVE the idea as much as I like the idea of radiant heated floors (If only they were in my house…..)!! Great job Kate! I agree, baby steps are the best way to remain consistent. I don’t need a shower curtain, but I love this post because I had never considered what that smell could be. Well, favorite thing in the bathroom is pretty hard to come up with–it is the smallest home in the house….it stays clean because it is the smallest room in the house…I still like the muted green colors that I put on 10 years ago–its a keep for awhile yet!! I only buy fabric shower curtains!! Just wash them and they are clean again for awhile!!! Ugh, I hate those shower liners! We have three bathrooms (well, 2 1/2), and I can’t say I love much about any of them–except for the fact that they’re the one room in the house that is a respite from being mauled by the baby! Though I do love the fabric shower curtain in my bathroom. I like my fluffy bath mat. The best thing about my bathroom would have to be the long counter top. It is good for so many things with my young children. And yes, Virginia, I agree with you about the heated towel racks. My husband has promised to install one if ever we are able to purchase our own dwelling. I love the window in my bathroom, even though it’s too high for me to see out of — it brings in fresh air and a view of the sky. I would be delighted to have the non-smelly IKEA PVC-free shower curtain to go with that fresh air! Well, I am blessed to have – not one, but two sinks in my bathroom. You can imagine how handy that is and what a blessing for a myriad of reasons. The shower curtain however is, well, gross. It should have been replaced a long, long time ago.